BRIGHTON, Mich - Back in February Ford Motor Company launched the "You Test" campaign; where they would give a select group of truck enthusiasts the opportunity to put the 2015 F-150 through the toughest test of all - their own. After months of reviewing roughly 15,000 submissions on BuiltToughTest.com, Ford narrowed it down to four lucky winners. The first 2015 F-150 "You Test" video that was released featured a systems engineer for military vehicle testing by the name of Brian Schober. Brian lives in Yuma, Arizona, so he put the 2015 F-150 up against a series of off-roading tests in the Arizona dessert -many of which are used to test military vehicles. 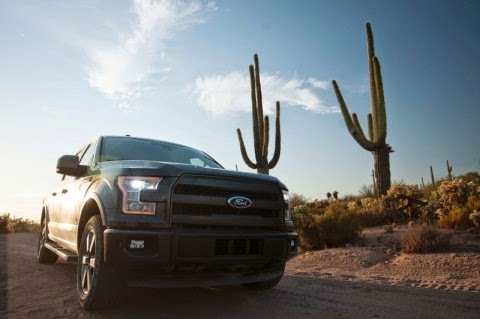 After 36 hours of plowing through a 10-mile loop with rock crawls, sand washes and suspension challenges in triple-digit temperatures, the 2015 F-150 sure earned its title of being "Built Ford Tough". Looking to learn more about all that the 2015 F-150 has to offer? Visit us today at Brighton Ford! We are located at 8240 Grand River Ave. just north of I-96 in Brighton. We are a family owned and operated business that strives for customer satisfaction. For more information on Brighton Ford visit BrightonFord.com or give us a call at (800) 836-7417.